Last Wednesday afternoon I took the Eurostar from a grey and dismal London to a sunny Paris. I decided that I would try to ignore the news while I was away. However, by Friday, temptation got the better of me. While sitting at a restaurant table in the small picturesque Parisian commuter-belt town town of St Germaine en Laye enjoying my lunch, I asked the waiter if he knew what the result of the EU referendum was. He expressed his shock at the decision of the British public to renounce their membership of the 28 member club. “That’s it”, he said, “the European project is dead”. I asked him whether he thought that this was a good thing or a bad thing? “It’s a bad day for Europe”, he exclaimed. “I’m not sure the project can continue to be run effectively with Britain gone but your heart was never really in it anyway”, he continued. He claimed that Britain had already negotiated for itself numerous concessions and any more would have effectively made the Federalist vision for Europe he was in favour of, a redundant concept. The British position he said was selfish in as much as the government appeared reluctant to use its economic muscle as leverage in order to help improve the living standards of the working classes within poorer nations of the EU which, according to him, was the ethos at the heart of the project. In other words, for the poorer nations to gain something, and for the European project to work, as he saw it, it was necessary for richer nations like Britain, to concede some financial ground at the expense of the poorer nations. He blamed David Cameron for triggering “an unnecessary referendum based upon unfair criticism of the EU and many years of misinformation about how it actually works”, which in turn was perpetuated by some of the most right-wing media in the whole of Europe. He also claimed that vast swaths of working class people were further disorientated by some political commentators and politician’s on the left of the spectrum who he said, “ought to have known better” than, for example, to effectively blame immigrant workers for allegedly undercutting British workers. All of this, he claimed, had eventually – from a Brexit perspective – “bore fruit”. It was difficult for me to disagree with any of this. 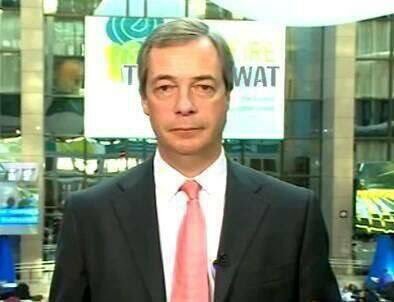 The news that the British people had decided to leave the EU appeared to have been as much of a shock to him as it was to me. The statistics show that the demographic of those who voted to leave were mainly the elderly age group and those who voted to remain were from the younger age group. However, the elderly will not be around for long compared to the young. It therefore, follows, the former will experience the consequence of a decision that they made to a far lesser degree than the latter who didn’t. It does seem strange that an ageing population who were allowed to vote but statistically are less able to make an informed decision with regards to issues that have long-term ramifications, are considered to be a better judge for what is best for the country than people who are, say, 16 or 17 years old but are prevented from voting on something that will effect them to a far greater degree and for far longer. For this and other reasons, it makes sense why younger people might be furious with older people. The latter, for example, have overseen the ruination of the environment that includes the spreading of poisons throughout the atmosphere, sea and soil. They have also overseen climate change, the ruination of entire economies and been at the forefront of the shift in wealth from the many to the few, which will mean that the generation to come will not only be poorer than the preceding one, but will die sooner. In short, the older generation have run the world for their own selfish short-term gain. The younger generation are suffering, and will continue to suffer, the consequences wrought by a post-war generation that were virtually guaranteed socioeconomic protections that will be denied to their young counterparts. This includes the concept of a job for life, free higher education and gold-plated, index-linked pensions that the elderly have taken for granted. Relatively speaking, the post war-generation have never had it so good, although one will be hard pressed to draw such a conclusion from the mainstream media. And to top it all, by disproportionately voting to leave, the older generation have now given a future to the young that they specifically do not want – problems that will be further compounded by the imminent growth in automation and increasing global competition. What is also bizarre is that countries and regions like London, Scotland and Gibralter wanted to stay in the EU within a context in which some of the most deprived parts of England and Wales were intent on leaving. In Boston, in North East England, for example, 75.6 per cent voted to leave the EU. Paradoxically, given that Brexit means that no more EU funds will be forthcoming to these deprived regions, it’s the poorest who will be most adversely affected as a result of this decision to leave. Consequently, it would appear that the poorest have been persuaded to make the decision to leave for the worse reasons, predicated largely on lies. These lies included the amount of money they were told the government spends on the EU and what amount, by contrast, it spends domestically. The leave campaign also understated the positives of continued membership in terms of the amount of funds Britain receives from the EU as well as insisting that by leaving the British people would have the prospect of being surrounded by fewer foreigners. 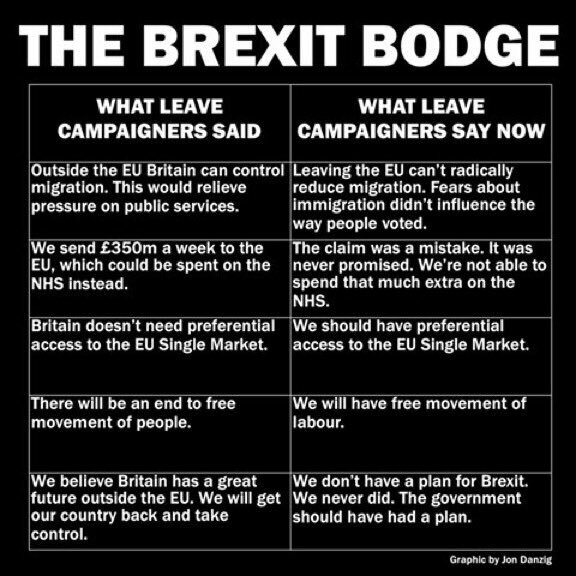 On all these points, and more, the public were lied to by the leave campaign. In terms of the second of these issues, for example, UKIPs Nigel Farage has already back-tracked in relation to his assertion that the £350 million a week that he wrongly claimed was spent on the EU would, instead, be spent on the NHS. The more likely scenario is the correct £161 million net figure will be used to pay for more tax cuts for the rich. Apparently leave have deleted their promises from their website. This is a useful aide-memoire. Almost a week has passed since the referendum result was announced and the Conservative government under PM David Cameron is in disarray. With the PM still not having made any definitive legal commitment to leave, the political consequences for the remaining 27 members is far from certain. With Britain’s new status outside the EU yet to be legally formalized, its legal sequestration remains uncertain. For all those who thought that the Brexit vote would have meant a hasty political decision to leave based on a legal determination, might need to think again. As I said in my previous post, in legal terms, the referendum is advisory not mandatory. What happens next is a matter of politics, not law – a determination that’s dependent upon whether the government decides to invoke Article 50 of the Lisbon Treaty. Even though I supported the remain camp, I respect the democratic decision the British people made when they voted to leave. Any decision to either seriously delay invoking Article 50, or any attempt at backtracking on the referendum result would, in my view, be totally unacceptable. Nevertheless, delaying the democratic decision of the majority is what the government appears to be intent on doing. Seemingly, this will involve the implementation of a possible second referendum. The government intends to respond to calls for it within the next few days. This will likely take the form of a debate in parliament following the signing of a government petition by four million people to that affect. Will the government give in to the demands set by the petition and thereby allow a second referendum to take place? The wider issue seems to be that unless the government can find a way of presenting simple solutions to a complex set of problems, people on the whole will not understand them. However, the problem is there are no simple solutions to such complex problems. Ultimately, David Cameron will go down in history as the man who set in motion the chaos and uncertainty that will almost certainly ensue in the coming days, weeks, months and possibly years. Because Cameron attempted to assert his authority over the Tory party, he assumed that by offering the people a referendum and winning it, would cement this authority and garner the UKIP vote as a consequence. But by losing, he has bolstered the xenophobic fringe within the UKIP and Tory parties, unleashed the potential for a rise in racist attacks and hastened the rush for Scotland to break from the UK. But perhaps most significantly of all, is that a final decision to leave, will prompt the 60 per cent of companies outside the EU who have their EU HQs in the UK and who trade with the EU, to re-locate elsewhere. If you headed a company that was based outside the EU but was big enough to have a EU HQs and you selected to be in a country that is now potentially going to be outside the EU, what would you do? It’s a no brainer. You would have to up-sticks and move to the EU. Having an EU HQs in a country that is no longer in the EU, makes about as much sense as having a US HQs in London. So in the event of Britain definitively leaving the EU both politically and legally, tens of thousands of jobs will be lost. This is a bare minimum of the chaos that is likely to occur set against a backdrop of increasing resentment, suspicion, xenophobia and racism. Buckle up, it’s going to be a bumpy ride ahead. I have never read such bile against the “elderly” before!. While you might not be able to disagree with your French waiter, your views about the older generations is just atrocious. I didn’t bother reading past that point because i don’t like reading stuff written by bigots. You make the sweeping generalisation that it is the older generation that have essentially f*cked up the world, and now we’re going to die and leave the youngster to have to clean up. Well, as a WASPI who isn’t getting a pension, thank you younger people, we just worked longer than you ever will I started paying my stamp (NI) at 14. Our generation changed the law so you can’t be sent to work when you’re that young. Our generation brought in liberal views, better wages, better working conditions, better education, the NHS as a modern functioning part of an active welfare state, we cleaned up the mess after WWII, etc etc. Oh yes and we gave birth to and raised your parents too. But on the other hand you cant say that many of us WASPIs were actually in control, Most of the working class were not in control of much and what they were was taken from us by Maggie and her later acolytes. You cant blame a generation because the usual suspects from the middle and upper classes f*cked things up then, just as they are doing today. So stop with the hate speech about people who may now be vulnerable and needing pensions and care. We’ve seen how the Brexit has sparked a wave of racial hatred and violence, and now you want to demonise and scapegoat the older generation, so we can be beaten and spat on in the street now? Are you aware that there were pro and anti in all age groups, and that of the young only 30% actually bothered to vote (leaving it to mummy and daddy perhaps) and then 25% of them actually voted for Brexit? Misusing the data to create a diversion and another scapegoated group is simply not acceptable. Listen, the elderly who voted Brexit must take some responsibility for the situation. There is a clear demographic line of demarcation in terms of the consequences of the actions of the elderly have for the younger generation who have to live their lives on decisions that a frankly overly bigoted section of society regularly make. I’m not young myself but nevertheless am able to acknowledge the damage overseen by right wing elements in our society, the proportion of whom are disproportionately elderly.That’s a fact and facts are stubborn things Your irrational and sectarian appeal to the elderly on the basis that they are, erm, old is hogwash, as is your emotional and exaggerated outburst. Face up to what the statistics tell us, namely that it’s the elderly as opposed to the young, who disproportionately vote for right wing parties that appeal to the kinds of xenophobic and racist sentiments to which the Brexit crowd have exploited. Do you mean to sound like a snivelling kid? Before you blame the older generation for all the word of the world perhaps you should reflect that in the referendum only 30% voted, so direct your ire at the other lazy ones. I say lazy because you obviously expect everyone else to do things to make your world perfect. But of course blame is the trade mark of the sectarian bigot, you not me. Go ahead and declare older people your wrinkly niggers, blindly regurgitating the Tory Nudge unit bilge to create another class of scapegoat to plunder and abuse. They are the ones who have been feeding you the divisive nonsense, to make you all feel so hard done by, that they have got what you want. Because that’s what you are, a Tory stooge, s collaborator in the divide and rule. It’s a good paradise, if you think blaming anyone other than the Tories for your problems. It’s a wonder that some are do easily lead. No matter you will obviously love Big Brother. He will tell you who to blame once the elderly have been taken care of and punished and impoverished , like the sick and disabled. I’m the Tory stooge? How did you manage to arrive at that conclusion? Of course, the English elderly who actually disproportionately vote for the Tories are not the stooges? Mmmm…You are a genius. as well as being in denial. The English elderly disproportionately vote Tory and are Brexiter’s. That’s a fact. Deal with it. Strange in that you say you respect the decision of the people but then spend a lot of time rubbishing them. You seem to think that anyone you disagree with is a bigot and /or irrational and their opinions are an outburst. The EU has pursued full-on neo-liberal policies for 40 years and an unelected commission has passed laws without regard to individual nations wishes. The last round of climate change discussions resulted in little or nothing to combat the greatest issue facing the world and what little there was is unenforceable. As far as workers rights are concerned real wages haven’t increased in 40 years and the rich get richer. Just look at the attempted imposition of austerity on French workers (which is hardly reported in our media). The eurozone is not just a minor blip. It was a cornerstone of German/French policy and collaboration with the IMF and WTO has impoverished Greece and is doing the same to Spain and Italy. There might have been peace in Europe over the post war years ( if we ignore the Balkans) but war has been exported to the Middle East and we are all reaping the consequences now, and all EU nations support NATO and its encircling of Russia. A united Europe was a great idea but it all turned sour. Clinging to the idealism of its inception in the belief that it still exists is a bad idea, but I understand why it is difficult for people to accept when a marriage has gone bad and a divorce is inevitable. Your comments about older people not being able to make a rational decision are patronising at best. Perhaps you think that John Pilger, Steve Keen and Richard Wolff are irrational bigots too? I respect the democratic decision that was made. That’s not to say that I agree with the decision. Big difference. I’m sorry if I didn’t make that clear enough. The point I was trying to make about the elderly is that historically it’s this group who tend to vote conservatively with a big and small c and that they will not be around to experience the consequences of their actions. It will be the young, who by and large voted to Remain who will be left to pick up the pieces. That’s a fact. I find it ironical that the age group who lived through the golden age of post war liberal democracy continue to disproportionately vote for its antithesis. The English elderly vote Tory and they voted Brexit, a double whammy for the young. That’s my view and nothing more. Another well written piece Daniel. I shudder to think what will happen. Did you hear the interview with Michael Heseltine on BBC4 about Boris Johnson? Very damning. I think the Queen will be thinking THIS year is the real ‘Annus horribilis’ . I feel sorry for the young people – we’ve cut down their opportunities greatly, shocking. Can you tell me how “we” have cut down the opportunities of “young people” ? Special reference to young people in Greece, Spain and the north of England would be helpful. The demographic breakdown is clear which I referenced in my blog piece.